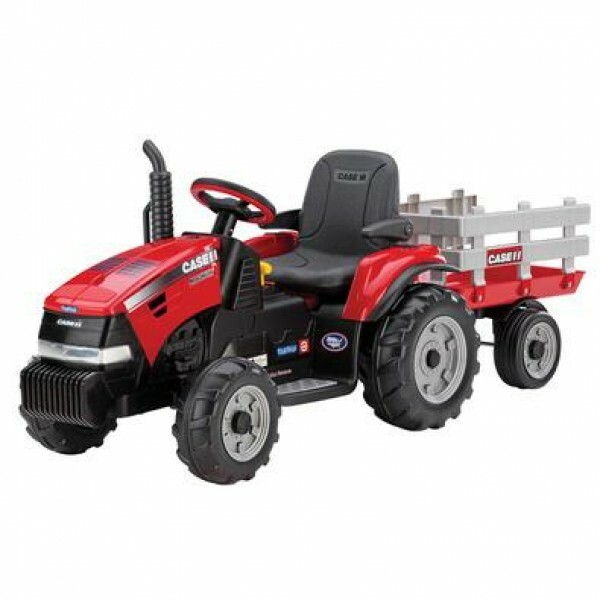 Give your little farmer an early start to driving a Case IH tractor all their own size. They can tackle multiple terrain including grass, dirt, gravel, or pavement with the farm tractor wheels. The SmartPedal accelerator can stop, coast and go in 2-speeds, 2¼ mph and 4½ mph. Parents, you can control the speed with the 2nd gear lockout. Outdoor play time will never be the same. Plus 4WD and automatic brakes in forward and reverse motion. The Case IH Magnum Tractor comes with a detachable stake-side trailer so they can cart around toys or make picking up sticks in the yard fun! Ride in style and comfort with the adjustable seat and flip-up armrests. 12-volt rechargeable battery and charger included. Made for maximum weight capacity of 85 pounds and for ages 3 and up. The enclosed drive mechanism and wiring is fully assembled; the accessory components are easily assembled.